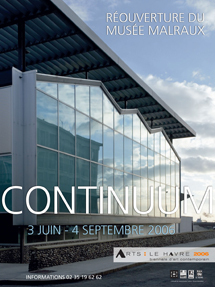 The contemporary art biennial Arts Le Havre 2006 presents an exhibition at the Musée Malraux featuring the work of several international artists, all guided by the structure of the palindrome. Entitled "Continuum", the exhibition is tied to the double-reading of the palindrome, its varied and possible reversals, and the dialogue fostered when read from left to right and from right to left. Above and beyond the mere symmetry of the grammatical structure, the works raise thought-provoking questions on the concept of double, contemplation, endlessly repeating cycles and infinity. "Continuum" is the first exhibition in the world that focuses on various explorations of the palindrome. Although it has long been found in many forms, the palindrome remains a recurring theme in the major challenges of contemporary art today. "Continuum" presents the general public with the work of numerous artists using a variety of media, ranging from video and sculpture to photography and literature. Viewers will also find brand new works, specially created for the biennial, as well as a wide range of works from Gary Hill and Hervé Robbe to Dana Claxton and Edruscha, carefully selected for their relevance. The exhibition also invites the public to play with palindromes.